BIAB is an acronym for Brew In A Bag. It is a dead simple all grain brewing technique. All it requires is a large grain straining bag, 15 gallon kettle and a propane burner. This method is excellent for brewers who are wishing to convert from extract brewing to all grain, because you can make that leap for a very minimal cost. It will also save an all grain brewer 1.5-2.5 hours on a typical brew day. If you combine this method with the No Chill brewing method also listed on this site, you can go from extract to all grain brewing for as little as $25! The kettle: This kettle is the ONLY vessel required to BIAB. The only special requirement is that the kettle have a volume of at least 15 gallons for a 5 gallon brew session. This is because this one vessel will have to hold your entire water requirement as well as your grain bill. This volume will regularly exceed 10 gallons. You will mash and boil in this vessel. The bag: This is a mesh bag that is large enough to conform to the inside diameter of the kettle and reach over the top lip. This bag is sometimes likened to a large pillow case, the kettle should be able to fit INSIDE it while still being able to close the top of the bag. Typically composed of “voil” or another mesh like material, this will hold your grain bill and must be strong enough to hold the water saturated grain when you lift it out of the mash water at the end of the mash. The heat source: This is typically the very popular “turkey fryer” burner that is used widely by home brewers. This will be utilized to provide heat for strike water, maintaining mash temperature, mash-out and the boil. Crush your grain finer than you would with a typical all grain brew. This is because you no longer have to worry about a stuck sparge. The bag is the filter and the finer crush will improve your conversion efficiency. Fill the kettle with the TOTAL water required to complete the entire brew session. Take into consideration that the water absorbed by the grain with this method is about HALF that of a typical all grain brew session that utilizes a MLT. Remember, when you remove the grain bag after the boil, the wort that is left is exactly what you are boiling, so calculate this carefully. Insert and secure the bag at this time. After heating the water in the kettle to your calculated strike temperature, pour your entire grain bill into the secured bag. 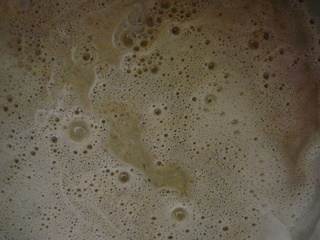 Use a mash paddle to thoroughly mix the grain with the water so that there are no dough balls. There will be a very large volume in the kettle, so temperature control should be as easy as intermediate stirring and a couple quick firings of the burner if the temperature drops. After the mash is complete you heat the mash to mash-out temperature, which is crucial to achieving good efficiency with BIAB since you are NOT rinsing the grains. 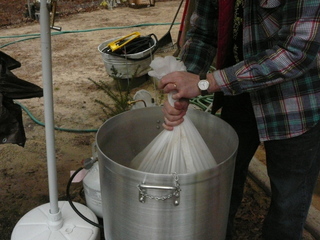 After mash-out, remove the grain bag and allow it to drain into the kettle. Some brewers will place a rope and a hook above the kettle to suspend the grain bag as it can become heavy with larger grain bills. Finally, boil the wort just as you normally would. **DO have a large enough kettle to accommodate about 9 gallons of water AND your grain bill. **DO have a bag large enough that you can fit the kettle INSIDE it and still close the top. **DO crush your grain fine, it will produce better conversion efficiency and there is no danger of a stuck sparge. **DO NOT skimp on mash time, this is more crucial with BIAB, mash for 60-70 minutes to achieve full conversion. **DO NOT allow your grain bag to come into contact with the bottom of the kettle when you are applying heat, it may melt! Some place a wire cake cooling rack in the kettle to lift the bag off the bottom. Photos courtesy of user “Daddymen” on homebrewtalk.com. Thank you! how much water should I be calculating for mash in? how much water can I assume will be absorbed in the grain and how much evaporated? Depending on your kettle and burner, up to 1.5G per hour of boil off. As for grain absorption figure 0.05 gallon/lb. So, for a batch that has 10 pounds of grain, a 60 minute boil, with a target amount of 5.5 gallons shoot for ~7.5 gallons. Was wondering about bag size. 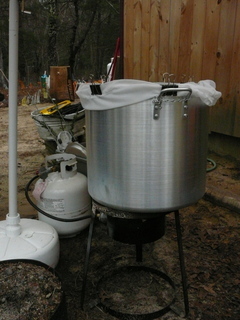 I currently have 15 gallon brew pot @ 18″ x 14.5″. I was wondering if the largest sized fine straining bag offered by Crosby and Baker @ 18 3/4″ x 19″ would be considered large enough from a diameter perspective? If you can fit the bag down on the bottom, flush to the walls of the kettle, and still have plenty of room above the rim you are fine. See pictures 1 and 2 above. What kind of material did you make your bag out of and where did you buy it? I’ve looked around in walmart and havn’t been able to find anything that seemed strong enough with a fine mesh. Just found out this technique…I was thinking about it, and now even before I could try it I see others did it with success!!! For a 5 gallon batch, where could I find a large straining bag? I saw these: http://www.winemakeri.com/ProductDetails.asp?ProductCode=16406, do you think they would be big enough? Thank you and great article! 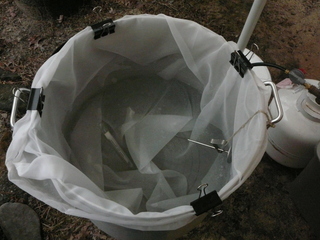 A 24″ x 24″ large grain bag will work for 5 gallon batches. As for the material, check out your local fabric store for nylon mesh or voil. Check out my blog for my biab experiences. I do biab exclusively. I’d suggest purchasing the voile from a fabric store, it’ll cost you $5 for one pot. Get enough fabric to put the pot inside and you’ll be fine. I use rack from a steamer pot in the bottom and direct fire with the grain bag inside with no problems. A quick rinse off with the hose and an occasional run through the washing machine and the bag will last a while. If you are on facebook there is a biab group as well, few members so far. What efficiency do you end up with? Is it a lot lower than a batch spagre system? Your eff. would be identical to that of a NO SPARGE system, which is easy to calculate. Your eff. losses will only result from losses in conversion eff. and losses due to grain absorption. Assuming 100% conversion eff. for this example and a total water volume of 8 gallons, the math would go like this. 10 pounds of grain would absorb approximately 1.0 gallons of water with BIAB. Assuming NO losses to conversion eff., meaning you achieve 100% conversion eff. Your losses would equal 1 gallon of the 8 that you started with, so 12.5%, giving you an eff. of 87%. DISCLAIMER: You may very well not see 100% conversion eff. This is an example of how to determine your eff. with BIAB if you know your conversion eff. If you can convert 80% of your sugars, you can see 70% eff. with this method using the math above. 70-75% eff. with BIAB is not uncommon as you do not have losses due to MLT deadspace. Typically the grain, since you are draining it from the grain sack, retains less water and you have fewer losses to grain absorption as well. In Australia another popular BIAB method is to use a 40 Liter electric hot water water boiling urn of the sort that you see in restaurants, church halls etc. The advantage is that it is a clean, self contained ‘turn on turn off’ system and has a built in tap of course. It is also helpful to have some sort of ‘sky hook’ to hang the bag from to drain. I use a simple pulley system. 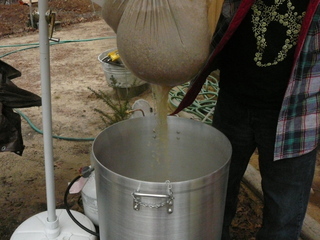 What about oxidation of wort by suspending the grain bag to drain? Does this lead to off flavors? I would be very interested in this process, but would like to know if others have considered this. Did some looking around on the web. I doubt there is much to worry about, but it is all anecdotal information. What if I have a 7 gallon brew pot and 15 pounds of grain? 1- I assume if I fill up to 6.5 and add 15 lbs of grain, it’s going to want to overfill? 2- What if I did say 5 gallons and added the grains..extracted the sugars as normal, then filled up w/ a gallon and a half of water? Why would that be a problem? I would still have the same amount of sugars extracted that I would in 7 gallons of water…right? That shouldn’t be a huge problem. It might take some experimentation to dial in the process. I would expect less extraction efficiency because of the thicker water/grain ration in your mash. You could try pouring the extra water over the grains, maybe catch the runoff with a pan, in order rinse extra sugars free. 15 pounds is a lot of grain for a 5 gallon batch by the way. With that 7 gallon pot you are limited to either smaller batches or OG < ~1.050. 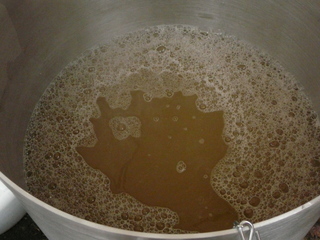 Another thought would be too add some malt extract at the end to boost the gravity a little. You may have to make a bag. I would do research to make sure the material is okay for mash temps. The links to the forums at the bottom of the original post above would be a good place to ask. Just a notice…http://www.biabrewer.info/ has a good Forum on the subject of BIAB. You may want to check it out. I am going to try to use this method for making tinctures but need to know where to find the bags. Also what gauge is the stainless steel pan. You’ll probably have to make your own bag. I have not seen these available at home brew stores. I’m not sure what is involved in a tincture, maybe a 5-10lb grain sack would work? My kettle has a 20 gauge bottom and a 24 gauge wall. I’ve done the BIAB method quite a few times….its great if you dont have a mashtun…..yes efficiency is lower….but not too bad….it is easy to do….but I have a mash tun and its just a better result using it….but BIAB is awesome….it would be great when traveling to brew…1 less thing to take(tun)….. I am not affiliated with this gentleman or his business, I’m just an extremely pleased customer. He does a great job making custom-sized bags and delivers a quality product. Capitalism to the rescue, thank you thughes for sharing!! I’m an avid BIABer… I started with extract brewing, but after 3 extract batches, really wanted more control over my hobby (which, by now, is more of an obsession). BIAB is really simple, is really fast, and has created some of the best beers I’ve ever tasted! One quick note…. I’ve found, just through my own personal BIABing, is that by using two 5gal pots and using 7gals of water between both of them, I’m constantly hitting my mark for 5-gallon batches pretty much on the nose. And that’s with pretty hefty grain bills. I believe the most I’ve mashed so far is 12.5 lbs. of grain (6.25 lbs in each pot). Because of your site I have moved to AG brewing, BIAB method, with awesome results! I purchased a 10 gallon kettle when I started in December 2011 thinking that I’d need the extra volume down the road. I’ve brewed three all grain beers this month alone, one with a 13.5lb grain bill and it was a full kettle! I also really like your Brew Day Sheets for extract but the AG Brew Day Sheet doesn’t completely apply to BIAB. Could you make a BIAB Brew Day Sheet? I suggest adding the Other Ingredients section that is on the Extract Sheet but is missing form the AG Sheet. That’s great man! Glad the brewing is going so well and we have been a part of that. As for the BIAB brew day sheet, that is now on the todo list.